I prefer, and recommend to others, to plant the ‘Miss Kim’ lilac, Syringa patula, ‘Miss Kim’ instead. It doesn’t get quite as large as the common lilac, doesn’t get powdery mildew and also blooms a little later, around Mother’s Day, with a strong, sweet scent. 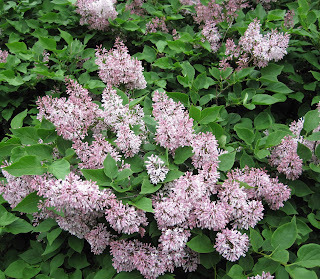 And for those who want the lilac fragrance in a smaller shrub, I suggest the Meyer Lilac, Syringa meyeri. It blooms in my garden after the common lilac, overlapping with the blooms of the ‘Miss Kim’ lilac. My lilacs, both ‘Miss Kim’ and the Meyer Lilac, are in full bloom right now. Early tomorrow morning, I’ll cut a few blooms, some that are not quite open, for a nice bouquet for my Mom. If you cut some blooms of lilac of your own to enjoy indoors, be sure to crush the ends of the stems to help ensure they can take up water. Would you like a large shrub in your garden that blooms around Mother’s Day, at least here in Zone 5? Then plant a Snowball Bush Viburnum, Viburnum opulus ‘Sterile’. I planted one in my garden for old time’s sake because my maternal grandmother had one in her garden and I remembered those big balls of white blooms in the spring. Later, I found out that my other grandmother also had one in her garden, but I never visited there in the spring so I never saw it in bloom. My aunt told me that they used to wear flowers when they went to church on Mother’s Day; a red flower, like a rose, if your mother was still alive, and a white flower, if your mother had died. She said my great-grandfather, who’s mother had died, always wore a big Snowball Bush bloom on his lapel on Mother’s Day. I find these blooms are best enjoyed on the shrubs. Once picked, they seem to quickly droop and shatter. 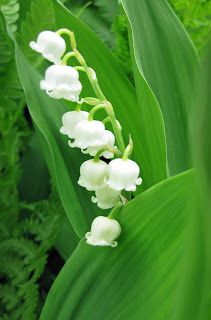 I’m fortunate to have always lived where the Lily of the Valley, Convallaria majalis, bloom. Lily of the Valley is generally sold as “pips”, and seems to be quite expensive for just a few pips, considering that this is a great passalong plant. I usually dig them out early in the spring, or whenever I can get to them, and then replant them where I want them or give them away. They do prefer shadier, moist locations, and once established, some people think they are almost invasive. But really, how could such a lovely fragrant bloom ever become a thug in the garden? When I was a kid, we would go to my grandmother’s house in Indianapolis and pick Lily of the Valley, perhaps on Mother’s Day. She had a very large patch of it, on the north side of her house. I noticed the other day that my Mom had a little vase of Lily of the Valley in her room that my little seven year old nephew had picked for her. I’m happy to see the tradition continues of picking Lily of the Valley for our mothers and grandmothers around Mother’s Day. What blooms in your garden for Mother's Day? Carol: Oh, and the fragrance of them all! Congrats on the nice piece in Horticulture magazine. You go! Our common lilacs are just starting to bloom now, and they're early. Mid-April is daffodil and forsythia time here. For Mother's Day, we're usually enjoying Narcissus poeticus. Much the same as your garden only I don't have a Miss Kim. I do have a poppy that has budded out. The first bloom fell off and I am waiting for the rest of them to open. I love the tradition of wearing the proper color flower for mothers day. I think it should be revived. I would have to wear white. Lily of the Valley became a thug in my garden by crowding out the Jack-in-the-Pulpits I planted. They also prevented me from planting anything else near them. I now keep them confined to two sunken containers. I wasn't aware of the tradition of wearing a red or white boutonniere for Mother's Day. That's such a nice thing. Oh, so lovely! I am getting my Lilac fix visiting all the beautiful blogs. Gardenias are blooming in my garden for Mother's Day. So pretty Carol. I planted a snowball viburnum at my last house - such a nostalgic shrub! Sweet William Phlox and Forget-me-nots, Happy Mother's Day! My Fragrant Snowball Viburnum is at last for the first time since I planted it 4 years ago, in full bloom.. the Variegated Flame Azalea is in high fashion bloom, my apple trees are flaunting their tresses most provocatively! and my wee small Japanese maples are still in flower with their bright red danglies! I can't get enough of lilacs and mine are going over now, so it's nice to see yours. Happy Mother's Day - we had Mother's Day in the UK in the middle of March. My lilac is all done. I have no idea what kind it is as it was a passalong plant from my mother who acquired it from an old house site on her property. It doesn't seem to be troubled by mildew at all, and I love it. What is blooming here right now is irises galore, plus dames rocket and dianthus as well. 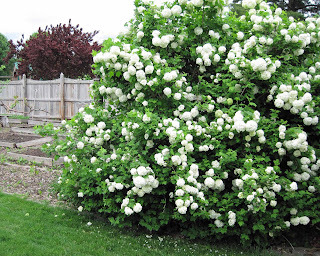 I have one of those snowball viburnums going right now, also the ninebark is blooming. It is hard to believe such beautiful and fragrant plants as lily of the valley and violets can become such thugs. It would be interesting to put them together someplace and see who won the contest. I had lilies of the valley in my border along the north side of the house, but they got moved somewhere else where there was no competition when they started KILLING my hostas. They just don't like to share, I guess. Not much in bloom here at the End of the Road. It will be another few days before the lilacs bloom. The old syringa vulgaris was here when we arrived along with a beautiful tall tall white lilac. I've added the Beauty of Moscow, Miss Willmott,and Ludwig Spaeth. Miss Canada will come along a little later. We've got room for lots more! Thanks for sharing three favorite old-fashioned flowers with us, Carol - miss all three down here! Miss Kim is quite a tidy and attractive landscape lilac, but Frances is right - can't beat a fragrant vulgaris or one of its hybrids, even if the shrub looks awkward. You're not supposed to get a chill smelling the lilacs...don't you remember your Mrs Greenthumbs? Her method was to prune the shrubs at the right time by cutting lots and lots of bouquets to enjoy inside the house. The flowers that I associate with Mother's Day - or at least my favorite part of my grandmother's garden - is a wild patch of yellow primroses, common purple violets and lily of the valley. I haven't been able to get it quite right in my garden but I keep trying. I loved lilacs and was always afraid to get them because of mildew problem..thanks for the direction on the lilacs that won't have that problem..
Hi I am new to your blog, and just love your garden photos! I have a Lilac that looks much like yours pictured here...I really don't know what kind though. But it is not blooming this year. I think it gets too much shade. You seem to know a bit about them, so I thought I would ask your opinion on if I should move it now or when dormant? What do you think?